1. I’m lovin’ this mild weather we’re having folks. The foggy crisp mornings, are just perfect for sipping hot coffee. The bright, sunny and warm afternoons are just perfect for walking or hiking. If it could stay just like this every day of the year I would be a very happy camper. It was so Beautiful on Tuesday that New Friend and I walked almost 10 miles from my house to the zoo and back! 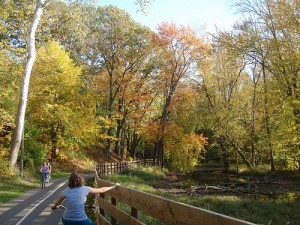 The Lansing River Trail. Thank the universe for a city with green space! 2. Coffeemate Italian Sweet Cream Creamer. So I’ve been loving this for a while, but it’s just perfect for these foggy early mornings. It makes my coffee perfectly sweet and milky without sugar or milk. Yum yum yummy. Liquid Coffee Crack. Seriously folks. 3. 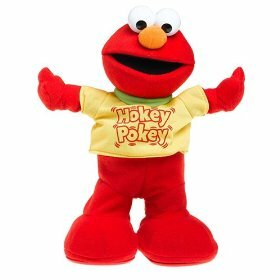 Hokey Pokey Elmo. Procured for Monk from her grandma for a mere 60 cents at a thrift store. It is good for nearly 30 minutes of entertainment. She goes absolutely nuts for it. Glad that when she’s over it only 60 cents and a few packs of batteries will have been sacrificed. Toy recycling rocks!! The Best 60 cents ever spent. 4. The time change. Never thought I’d appreciate a good ‘fall back’. In fact I was a bit bitter about it earlier in the week. But today it felt great to be up so early, I almost felt well rested. And it gave me a great excuse to drink three cups of coffee with Italian Sweet Cream! What are you lovin’ today? Link up your blog at Marlie & Me and join in on the love! How cute is the Pebbles ponytail on top of her head? Lovin’ it!